Professor Boleslaw (Bolek) Wyslouch joined MIT in 1982 as a research associate and doctoral student with the Electromagnetic Interactions (EMI) group, earning a PhD in physics in 1987. After postdoctoral appointments at MIT's Laboratory for Nuclear Science (LNS) and the European Laboratory for Particle Physics (CERN) in Geneva, Switzerland, he joined the MIT faculty in the Department of Physics in 1991 as an Assistant Professor. He became an Associate Professor with tenure in July 1998, and in July 2002 he was promoted to full Professor. Prof. Wyslouch is the Director of MIT’s Laboratory for Nuclear Science (LNS) and a member of the Relativistic Heavy Ion Physics Group. His research is focused on the studies of extremely hot and dense states of nuclear matter using very energetic collisions of heavy ions. He is one of the founders and leaders of the heavy ion program in the Compact Muon Solenoid (CMS) experiment at the Large Hadron Collider (LHC) at CERN in Geneva, Switzerland. His work is closely related to the work of Professors Gunther Roland, Yen-Jie Lee and Wit Busza at MIT. The earliest runs of the LHC showed that hot plasma strongly suppresses production of high-energy jets, redistributing the jet energy among slow particles. The CMS heavy ion group discovered surprisingly strong collective effects in ion-ion collisions, as well as in proton-proton and proton-ion collisions. The heavy ion physics program at the LHC is entering a new phase in 2015 with the highest energies ever created in the laboratory and with much-increased luminosities. Before joining CMS, Wyslouch conducted multiple high-energy and nuclear physics experiments at DESY, CERN and the Brookhaven National Laboratory RHIC facility. He took a leadership role at Brookhaven in building PHOBOS, a detector designed to study the quark-gluon plasma. Prof. Wyslouch was recognized for his contribution to education at MIT with a 2004 William W. Buechner Teaching Prize. He was elected a Fellow of the American Physical Society in 2013. Dr. Karen Dow joined the MIT staff in 1987 as a sponsored research staff member at MIT’s Bates Linear Accelerator Center. She received her A.B. in physics and mathematics from Mount Holyoke College in 1982, and her Ph.D. in physics from MIT in 1987. She has been an MIT Principal Research Scientist since 2005. At Bates, Dr. Dow was responsible for data acquisition systems, and was promoted to Research Support Group leader and then Engineering Division head. In 2006, she was named Associate Director of Bates, and served in that position for over five years. Her research has focused on medium energy nuclear physics, including properties of few-body systems, the use of polarized electrons to test weak interaction theories and study nuclear and nucleon structure, and the applications of particle detection techniques and particle accelerators to medical physics and cargo-screening problems. Her most recent nuclear physics research has been on the BLAST and OLYMPUS experiments. 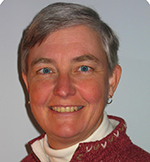 In addition to her work for MIT, Dr. Dow has served in various elected and volunteer positions, including her town’s Board of Library Trustees, School Committee, Board of Selectmen and Finance Committee, and the Mount Holyoke College Alumnae Association’s Alumnae Honors Research Committee.